Sayacmarca, Inca Trail to Machu Picchu. Photo: Renzo Uccelli. 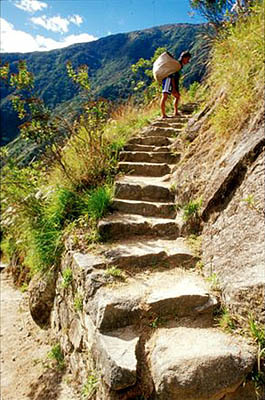 Luxury Inca Trail. The flight and transfer went very smoothly. We were met by both a driver and the local rep and they helped us check into the hotel and get straightened out. On our first full day we had a very interesting tour of the city. Ceaser, our guide was extremely knowledgeable and I'd recommend him to others. Lunch was good, a really beautiful place. The dinner at Astrid & Gastón was excellent. Nice art work in the restaurant. From a room perspective, the hotel is clearly very high quality but our room could have been in a better location in the hotel. I know the local rep tried to have us moved to a different room when we checked in but she wasn't able to switch us. 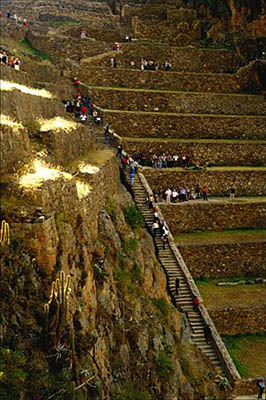 Agricultural terraces, Fortress of Ollantaytambo, Sacred Valley. Photo: Mylene d'Auriol Stoessel. 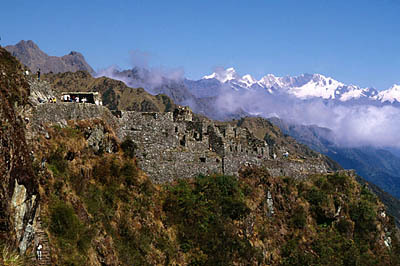 Luxury Inca Trail. This was a really long day. We met the Cuzco rep, the driver and our guide Edison at the airport. Everything went smoothly. We then went through a brief tour of Cuzco and then some sites of the surrounding area. We really liked the lunch place Pio's El Huacatay. I'm not sure what happened, maybe a combination of altitude, too much sun and some food made me very sick at about 5. We had to skip the Hike in the Pisaq ruins because I was still sick in the morning. But, I managed to get up around noon and we went to lunch at Hacienda Huayoccari. I think I would have really enjoyed this lunch (as I know Jessica did) but I was still recovering. We went briefly to the Ollantaytambo ruins afterward ­ this was a great place. New Year in the hotel was very festive, lots of fireworks and good food. But we couldn't stay out all night because of hiking the next day. In hindsight, I know Pisaq is pretty far and from a scheduling perspective it might be good to have some down time anyway as you are adjusting. A nice, fun place. Very attentive staff. Didn't eat dinner as we were exhausted and I was beginning to get sick. This was the New Year's buffet, so I'm not sure we can comment on the normal food. But as far as a buffet goes, I thought it was good. With respect to the hotel, probably the nicest staff of all the hotels. They were very concerned about my health as was the entire Cuzco team. The room had a great view and the grounds were very nice. Porter on the trail toward Wiñayhuayna, Inca Trail to Machu Picchu. Everything went perfectly. Our guide (same as entire time in Cuzco), Edison was excellent. We didn't start too early (after 10) and had no problem reaching the first campsite by 4. On the second day, we made a decision with Edison, to go over the first pass to a different campsite that was further along for the second night. I think, this made a lot of sense, and although it was a little crowded, got us over the fist pass on the second day. I would probably recommend this to people. If you don't the 3rd day will be really difficult as you will have ascend all three passes. Plus it rained hard all day, so there was no reason not to keep going. Clearly the third campsite is incredible. I don't know what to really say about this hike except that it is really amazing. Difficult at times, but manageable. We went pretty quickly, but then at some areas really looked around and enjoyed ourselves. Edison was very aware of our fitness level and made sure we kept on track. Or, as was often the case, allowed us to take time at certain sites. When we arrived at Machu Picchu, we were definitely glad to get to the hotel and shower. But, again, this is an excellent hike and not too strenuous. The hotel is nice, but I guess the best thing, obviously, is the location. On the fifth day, we hiked Wayna Picchu at 7AM (without Edison). This is something I would strongly recommend to others. It will be easy after the hike, and some of the best views and pictures can be taken from there. We also got a late checkout, which allowed us to hurry down and then take a shower before checking out. Edison met us around 11 and we toured the ruins and then had lunch and then to the train. If the helicopter was an option, I would have liked to do that. The train is a little slow, but, I saw a bear on the way so that was pretty neat. With respect to the porters, guide, chef everything was perfect. In fact, I actually preferred our chef's cooking to any of the restaurants. A little simpler food, which I enjoy. He did a great job with Jessica's dietary needs, in fact lots of the food was entirely vegetarian and I also enjoyed it. We had fun playing cards and drinking wine with the group. The wine was excellent. Having the portable toilet is a huge plus. I can say without that I don't think Jessica would have enjoyed herself. The tent and sleeping bags were good. We had followed the instructions you provided and were well prepared. The only things I should have brought were an inflatable pillow, and also some slip on (over the sock) flip-flops or sandals. At night, it was pretty chilly and having flip-flops or sandals that you could slip over your socks would have been convenient. Having good rain gear is a requirement if you go when we did ­ it was worth every penny. The dinner at the hotel was very good. We ate in the restaurant and, like dinner, the food was very good. The best thing about the Sanctuary Lodge is the location and that it allows you easy access in the morning to Machu Picchu. The bus ride is painful, and it would have been very inconvenient to stay in the town below. 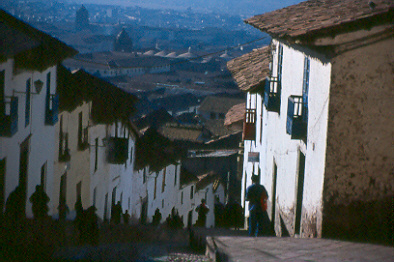 San Blas artisans' quarter, Cuzco. Photo: Walter H. Wust. 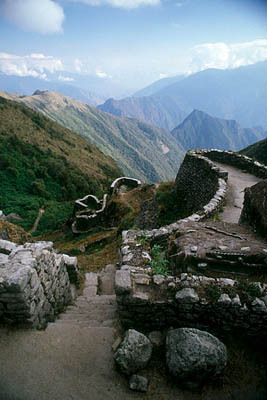 Luxury Inca Trail. Cuzco is a really interesting city, the type of city that Jessica and I really like. Edison was able to mix in some shopping with the tour. At this point, we had reached our threshold so it was good to go quickly to and through some of the sites. The hotel restaurant is very good and we enjoyed ourselves. This restaurant seemed a little touristy to us, the food was fine. The restaurant was also good, but not as good as the Monasterio. It was a very convenient and interesting location. Might have enjoyed going someplace else though, maybe a local place in town. This was no doubt the nicest hotel of all. Really unbelievable rooms, artwork and great food. 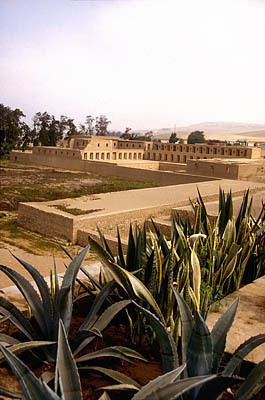 House of the Virgins of the Sun, Pachacamac, c. 1500 AD. The surfboard shaper and his whole family were really friendly and interesting. I had a great time talking with him and then surfing as well. Of course, the surfing is well regarded in Lima and they did a great job picking out a spot that was a good match for my skill level. He also let me use a pretty unbelievable surfboard (the same board that was used by the Peruvian National long board champion last year)! We ended up surfing for a few hours, and since we had a little bit of a late start, we decided to cancel the other activities and museums. It was a good and fun way to end our vacation. If you have other people interested in surfing I would strongly recommend this excursion to them. This was just a box lunch, but was fine. So, this was kind of strange. The hotel had a great menu, but I don't know what was happening -- it was almost like they were understaffed. The service was really bad. We told Anne Marie and she spoke with the hotel about it. Considering the hotel, this was a pretty shocking. We had an unbelievable room this last day; it would have been great to have had this room the first 2 nights. © 2013 Marcia Brandes. All rights reserved.